Photographers would be lost without the raft of camera accessories that support their photo shoots. From the bags used to carry their kit and the tripods that permit long exposures right down to the smaller essentials the keep dust away from sensors and lenses, photographers always have a handful of accessories that they couldn't be without. Here are some best camera accessories that deserve your attention. Whether you want to splash out on a sturdy tripod or a lighting solution, or just chuck a few useful extras into your kit bag, read on to get up to speed on what today's photographer relies upon for their craft. A lighting solution that makes conventional flashguns pretty much redundant, the NEO 2 employs an LED panel to offer both continuous light and flash, with zero recycle times and up to 85,000 flashes on a fully charged set of batteries. Functionality is bolstered by the further option of high speed sync shooting and built-in Elinchrom Skyport receiver, and you can adjust the colour temperature of the light in fine increments to suit the subject you're shooting. How many regular flashguns can claims all this? Precisely zero. The straps the come with DSLRs and mirrorless camera might be fine for occasional use, but as any Blackrapid user will attest, they’re far from an ideal solution if you plan on carrying your camera for most of the day. This ingenious strap shifts the weight from your neck to your shoulder for comfort, and has a locking mechanism that keeps the camera in place by your side as you move. This affordable powerbank boasts a powerful 20100mAh battery in a sleek and portable shell, making it a great option for keeping a compact or mirrorless camera battery charged when you’re not near a power source (providing it offers this through its USB port). And when you’re not using it to charge your cameras, you can keep you phone or tablet juiced up, with enough capacity to fully charge an iPhone 7 almost seven times over. Still very much the affordable shotgun mic of choice for anyone intending to record high-quality speech with their camera, the VideoMic Pro has Rycote’s Lyre suspension system integrated into its design to separate it from the camera, thus reducing the chance of you operating the camera or lens being picked up on recordings. The built-in foam shield also minimses wind noise, so it’s great for shooting on location in addition to indoor use. With enough space for a two DSLRs and zoom lenses attached, together with six additional lenses, a 13in laptop, and plenty of space left over for accessories, this stylish solution from Loewpro lets you carry everything you need for full day’s shooting in comfort. Loops on the side allow you to hook on a tripod, while the integrated All Weather AW cover provides extra protection should you get caught up in inclement weather. Great if your laptop or desktop computer doesn’t have a built in card slot (we're looking at you Apple), this neat USB 3.0 card reader supports the very latest UHS-I and UHS-II SD card formats, as well as older non-UHS cards. Well made, while the design means neighbouring ports can be accessed. Pop this lightweight mini softbox on your flashgun and it’ll soften its output without you needing to bounce it from any other surfaces. This makes it particularly useful for when you’re working outdoors, especially if you're working alone and you don’t have a reflector to hand, and so it ideal for the mobile portrait photographer that might find themselves shooting on a range of locations. This Pro version of Datacolor’s SpyderX aims to ensure that your monitor is displaying things exactly as it’s supposed to, so you can edit with greater confidence. It comes in two flavors - Pro and Elite, with the Pro version the more affordable option, as the Elite version is designed for users who want to ensure multiple displays (including projectors) are calibrated and perfectly color-matched. The software easy to use, while it's also quick to calibrate your monitor, delivering accurate and pleasing results. If you're looking for a hassle-free way to make sure your monitor is displaying colors correctly, this is it. Adobe’s Creative Cloud Photography Plan rounds up the company’s best-known programs for photographers, namely Photoshop CC and Lightroom CC and Lightroom Classic. 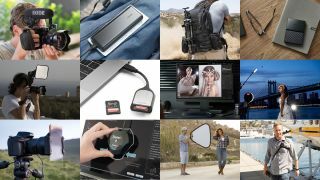 It also throws in 20GB of cloud-based storage space to play with so you can access your masterpieces from a computer, tablet or smartphone, wherever you find yourself. The software is constantly updated, not just to add new features but also to provide raw support for the latest cameras. Stylish, colourful, fast - what's not to like? Masses of storage space inside a compact casing, this 4TB drive is bus-powered for convenience, making it a take-anywhere option for the more mobile photographer. It boasts password protection to keep your images safe and automatic backup to keep it updated, together with protection against general knocks and scrapes. Not taken by the standard black finish? You can opt for one of seven other colourful option instead. If you're looking for something even more durable than the WD My Passport drive, then take a look at Sandisk's Extreme Portable SSD. Not only is it rain, splash, dust and spill proof, but packed inside is a stable solid state drive (SSD), available in sizes from 250GB to 2TB. With fast read and write speeds, this compact and well-made drive offers quick access to your images out in the field. If you want to be active with your photography - whether that means hiking or cycling with your camera, then Cotton Carrier's Skout could be the answer. It's a chest-style camera mounting system that's designed to hold your camera close to your body, and allow quick access to it when you need it. It features a patented Twist & Lock mount system designed to keep your kit in a fixed position close to your chest so it won't bounce round your neck when you're on the move. When you want to stop and shoot, a simple twist of your camera will release it from its anodized aluminum hub. There's also a tether to avoid accidents, and for added security. To protect your kit from the elements the Scout features a weather cover that your can pull over your camera, while there's also a stash pocket that will accommodate a smartphone or credit cards. Sigma lens user? This affordable dock lets you squeeze every bit of goodness out of your optics. Just pop it onto the rear of your lens and use the accompanying software to update the lens’ firmware and fine-tune focus settings, and even adjust the Optical Stabilizer if you lens offers this. If you use of Tamron’s more recent lenses, you may also be interested it its own version, the TAP-in console. Lens cloths may not be the most exciting accessories, but they’re essential for keeping your lenses, viewfinders, LCDs and other surfaces spotless. And this one from Spudz is more handy than most, as it folds into its own integrated cover when not in use to keep it clean. It costs next to nothing and packs away into a tiny space that makes its inclusion in any kit bag a no-brainer. A set of carbon fibre legs and an aluminium ballhead kit that commands the same price as many aluminium legs alone, this all-in-one solution from Manfrotto has an 8kg payload, which is more than sufficient for the vast majority of camera and lens combinations. It extends to a respectable 164cm maximum height and you can even slip one of the legs out and use it as a monopod if you need to. Many photographers have a small collection of SD cards, which are small enough to easily lose and not always sturdy enough to keep way from possible damage. This robust case from Beeway not only keeps up to 12 SD and 12 microSD cards secure in individual rubbered compartments, but its silicone seal keeps water and dust from getting in too. With the average camera being compatible with hundreds of different memory cards, how do you decide on the best one? How about going for high-capacity, super-fast option from a renowned brand, with protection against water and shock and free image recovery software thrown in? This option from SanDisk ticks all those boxes and doesn’t cost a fortune. A sturdy monopod with a difference, the inclusion of three rubbered feet means you can place this down more securely that usual, while a ball-and-socket mechanism lets you tilt the monopod while keeping the feet in the same spot. Flip locks let you lock and unlock the legs at speed, while the 163cm maximum extension is about as long as many tripods can manage. Polarisers can be costly, particularly those designed for lenses with larger filter threads, but you needn’t spend a fortune for something that will just to do the job well. This affordable option from HOYA boasts a matte black finish and multi coatings to reduce reflections, together with a slim profile to keep vignetting out of the frame. A great way to quickly deal with dust and other particles from camera sensors, this classic kit-bag staple weighs next to nothing but is super useful. It's also ideal for getting into hard-to-reach viewfinders and for giving lens surfaces a quick clean. The large chamber allows you to give a good blast of air, and as a contact-free method it’s safer than other approaches. Need a rock-solid travel tripod that’s a little different to the norm? You've found it. Available in four different colours, this option from MeFoto has a massive 12kg payload but folds down to just 42cm, making it short enough to fit into the average bit of luggage or even backpack. You can also slip off a leg and use it as a monopod with the centre column. ND grad filters are found in any serious landscape photographer's kit bag, and this triplet provides all the control one needs to balance brighter skies against darker foregrounds, with the soft gradation making them ideal against a gradually changing vista. They're hand made and totally neutral to prevent any colour casts from forming too. Shooting a horizon? Go for the hard-edged filter set instead.